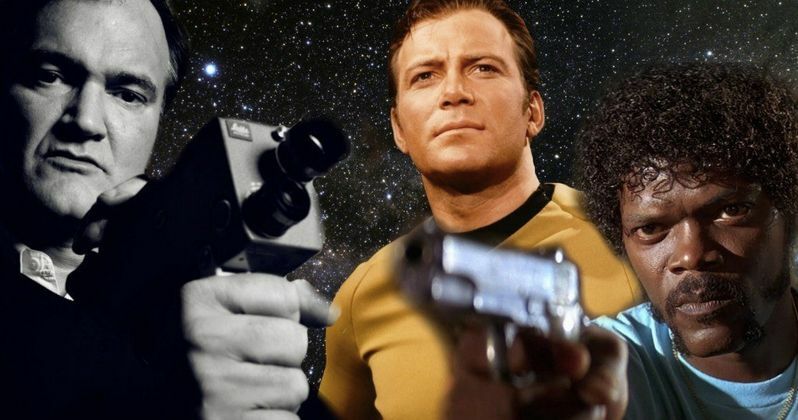 If you haven't already heard the crazy news, Quentin Tarantino is working on a Star Trek Movie. He recently pitched the idea to Paramount Pictures and J.J. Abrams and now the project is moving forward rather quickly, with Abrams set to produce. It's been revealed that the studio and Tarantino are zeroing in on a writer, which is encouraging for those who want to see this movie actually happen. But that's not the most interesting part. Not by a long shot. According to a new report, this will be the first R-Rated Star Trek movie ever. Here's what Deadline had to say about it. "Tarantino has required it to be R rated, and Paramount and Abrams agreed to that condition." On the one hand, it's not that surprising that Quentin Tarantino would want this mysterious Star Trek movie to be R-rated, as every movie he's ever directed has been. On the other hand, it's pretty amazing that Paramount is willing to allow Star Trek to boldly go in that direction, since it's never ventured into that kind of territory. However, movies like Deadpool, Logan and IT have proved that an R-rated movie can still be incredibly lucrative. Audiences just want to see a good movie. Plain and simple. Currently, Quentin Tarantino is not locked in to direct this R-rated Star Trek movie, but the pitch is his and he's at least going to produce. If he likes the script, there's a chance he'll direct as well, which would mark the first time in his career that he's tackled a franchise movie. As for the script, Tarantino reportedly spent hours in a writer's room with Mark L. Smith (The Revenant), Lindsey Beer (Chaos Walking), and Drew Pearce (Iron Man 3). They reportedly kicked around a lot of ideas and, at the end of the long process, Smith emerged as the frontrunner. Though, he hasn't locked down the gig just yet. At the moment, Quentin Tarantino is working on his new movie, known only as #9, for Sony. J.J. Abrams, who rebooted Star Trek for Paramount and will executive produce this new movie, is busy prepping Star Wars: Episode IX. That will give Paramount the time they need to get this new Star Trek ready, providing the writer with plenty time they need to complete the script. Tarantino has said he's going to retire from redirecting after his tenth movie. If this works out, that means his final movie very well could be this R-rated Star Trek movie. Plot details are currently being kept completely under wraps for now, but Quentin Tarantino did speak about doing a movie based on the Star Trek: The Original Series episode City on the Edge of Forever and the Star Trek: The Next Generation episode, Yesterday's Enterprise on an episode of The Nerdist Podcast in 2015. Deadline's new report doesn't clarify if this movie will take the place of the proposed Star Trek 4, but it seems unlikely that movie would still happen, given the disappointing box office for Star Trek Beyond.